A new study from researchers at the University of Illinois and colleagues at the Agency for Science, Technology and Research in Singapore used CRISPR technology to turn on unexpressed, or "silent," gene clusters in Streptomyces, a common class of bacteria that naturally produce many compounds that have already been used as antibiotics, anti-cancer agents and other drugs. 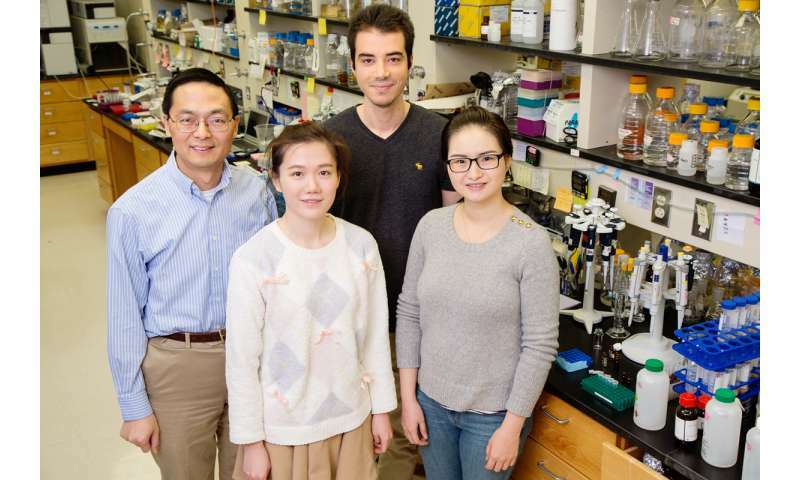 The study, led by chemical and biomolecular engineering professor Huimin Zhao, was published in the journal Nature Chemical Biology. "In the past, researchers just screened the natural products that bacteria made in the lab to search for new drugs," Zhao said. "But once whole bacterial genomes were sequenced, we realized that we have only discovered a small fraction of the natural products coded in the genome. "The vast majority of biosynthetic gene clusters are not expressed under laboratory conditions, or are expressed at very low levels. That's why we call them silent. There are a lot of new drugs and new knowledge waiting to be discovered from these silent gene clusters. They are truly hidden treasures." To mine for undiscovered genomic treasure, the researchers first used computational tools to identify silent biosynthetic gene clusters - small groups of genes involved in making chemical products. Then they used CRISPR technology to insert a strong promoter sequence before each gene that they wanted to activate, prompting the cell to make the natural products that the genes clusters coded for. "This is a less-explored direction with the CRISPR technology. Most CRISPR-related research focuses on biomedical applications, like treating genetic diseases, but we are using it for drug discovery," Zhao said. His lab was the first to adapt the CRISPR system for Streptomyces. "In the past, it was very difficult to turn on or off a specific gene in Streptomyces species. With CRISPR, now we can target almost any gene with high efficiency." The team succeeded in activating a number of silent biosynthetic gene clusters. To look for drug candidates, each product needs to be isolated and studied to determine what it does. As a demonstration, the researchers isolated and determined the structure of one of the novel compounds produced from a silent biosynthetic gene cluster, and found that it has a fundamentally different structure from other Streptomyces-derived drugs - a potential diamond in the rough. "Antimicrobial resistance is a global challenge. We want to find new modes of action, new properties, so we can uncover new ways to attack cancer or pathogens. We want to identify new chemical scaffolds leading to new drugs, rather than modifying existing types of drugs," he said.